T cells — immune cells that are targeted to find and destroy a particular antigen — are key to the adaptive immune response. 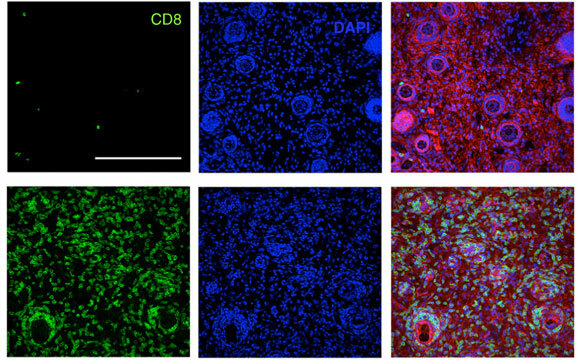 In this image, the top row shows few T cells in untreated mice, while the bottom rows show many T cells produced after immunotherapy treatment. Using a combination of four different therapies, researchers from MIT reveal a new treatment that destroys tumors in mice. Harnessing the body’s own immune system to destroy tumors is a tantalizing prospect that has yet to realize its full potential. However, a new advance from MIT may bring this strategy, known as cancer immunotherapy, closer to becoming reality. “We have shown that with the right combination of signals, the endogenous immune system can routinely overcome large immunosuppressive tumors, which was an unanswered question,” says Darrell Irvine, a professor of biological engineering and of materials science and engineering, and a member of MIT’s Koch Institute for Integrative Cancer Research. This approach, which could be used to target many different types of cancer, also allows the immune system to “remember” the target and destroy new cancer cells that appear after the original treatment. Irvine and Dane Wittrup, the Carbon P. Dubbs Professor of Chemical Engineering and Bioengineering and a member of the Koch Institute, are the senior authors of the study, which appears in the October 24 online edition of Nature Medicine. The paper’s lead authors are MIT graduate student Kelly Moynihan and recent MIT PhD recipient Cary Opel. Tumor cells often secrete chemicals that suppress the immune system, making it difficult for the body to attack tumors on its own. To overcome that, scientists have been trying to find ways to provoke the immune system into action, with most focusing their efforts on one or the other of the two arms of immunity — the innate immune system and the adaptive immune system. The innate system consists of nonspecific defenses such as antimicrobial peptides, inflammation-inducing molecules, and cells such as macrophages and natural killer cells. Scientists have tried to get this system to attack tumors by delivering antibodies that latch onto tumor cells and recruit the other cells and chemicals needed for a successful attack. Last year, Wittrup showed that delivering antibodies and IL-2, a signaling molecule that helps to boost immune responses, could halt the growth of aggressive melanoma tumors in mice for as long as the treatment was given. However, this treatment worked much better when the researchers also delivered T cells along with their antibody-IL2 therapy. T cells — immune cells that are targeted to find and destroy a particular antigen — are key to the immune system’s second arm, the adaptive system. Around the same time, Irvine’s lab developed a new type of T cell vaccine that hitches a ride to the lymph nodes by latching on to the protein albumin, found in the bloodstream. Once in the lymph nodes, these vaccines can stimulate production of huge numbers of T cells against the vaccine target. After both of those studies came out, Irvine and Wittrup decided to see if combining their therapies might produce an even better response. The researchers tested this combination treatment in mice that were implanted with three different types of tumors — melanoma, lymphoma, and breast cancer. These types of engineered tumors are much more difficult to treat than human tumors implanted in mice, because they suppress the immune response against them. The researchers found that in all of these strains of mice, about 75 percent of the tumors were completely eliminated. Furthermore, six months later, the researchers injected tumor cells into the same mice and found that their immune systems were able to completely clear the tumor cells. “To our knowledge, nobody has been able to take tumors that big and cure them with a therapy consisting entirely of injecting biomolecular drugs instead of transplanting T cells,” Wittrup says. “Exploiting the existing, endogenous, normal T cell repertoire of the tumor-bearing mouse (or human) overcomes the need for T cell transfer, making the therapy more readily applicable in the clinic,” says Willem Overwijk, an associate professor at MD Anderson Cancer Center, who was not involved in the research. Using this approach as a template, researchers could substitute other types of antibodies and vaccines to target different tumors. Another possibility that Irvine’s lab is working on is developing treatments that could be used against tumors even when scientists don’t know of a specific vaccine target for that type of tumor. The research was funded by the Koch Institute support core grant from the National Cancer Institute, the National Institutes of Health, the Bridge Project partnership between the Koch Institute and the Dana-Farber/Harvard Cancer Center, the V Foundation, and the Ragon Institute of MGH, MIT, and Harvard. Be the first to comment on "Two-Pronged Immune Response Destroys Tumors"